Even if the wound looks superficially harmless, steam burns must be cooled persistently. Empa researchers have now been able to show for the first time how hot steam achieves its vicious effect: It penetrates the upper skin layer and can cause severe burns in the lower skin layers—initially almost invisible. Whether working with steam pipes or in the kitchen: When boiling hot steam hits the skin, it will quickly cause burns. Firefighters are also at risk—due to their own sweat: If it evaporates under the heavy protective clothing in the heat of the fire and cannot escape, it condenses on the cooler skin and burns it. Skin burns caused by water vapour are often particularly malicious: If the skin is only exposed to the hot vapour for a short time, it is possible that the burn looks harmless on the surface—while the lower skin layer is severely damaged. So why is that? Until recently, there was no response to this question because, unlike dry heat burns, the exact mechanisms of steam burns are still poorly understood. Researchers in Empa's Biomimetic Membranes and Textiles department have now solved this mystery. 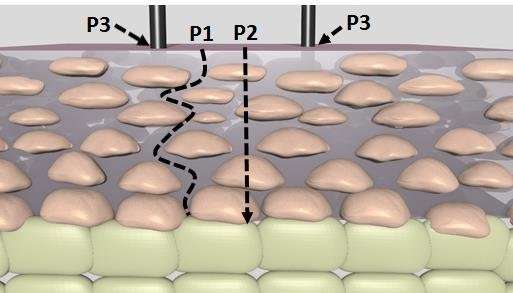 "We were able to show that the uppermost skin layer, the epidermis, cannot properly perform its protective function against water vapour," explains René Rossi, head of the research group. "The steam penetrates through the skin pores onto the lower skin layer, the dermis. Only there does the steam condense, thereby releasing its thermal energy directly onto the sensitive dermis—and thus directly triggers second-degree burns". And indeed, it turned out that when the skin is exposed to hot steam, the heat penetrates the underlying skin layers faster and deeper than with dry heat. The experiments showed that the water content of all skin layers already increases within the first 15 seconds. The reason for this is that the uppermost skin layer has pores which are usually much larger than a water molecule—and the water vapour can pass through them unhindered. Only when the epidermis is swollen by the absorbed amount of water, the pores become too small for the water vapour—but then the damage is already done in the lower skin layer. One problem with all burns is the so-called afterburn effect: the epidermis is a relatively poor heat conductor. Once the skin has absorbed heat—especially in the deeper layers of the skin—it releases it very slowly. As a result, the heat can act on the tissue for longer and damage it even more. This effect is often particularly strong in the case of burns caused by water vapour, as the heat penetrates deep very quickly. "In the case of a steam burn, the skin must therefore be cooled for a long time—two minutes in an ice bath is not enough to dissipate the high amount of energy from the deeper layers of skin," explains Rossi.